Have you tried variations on mashed potato? 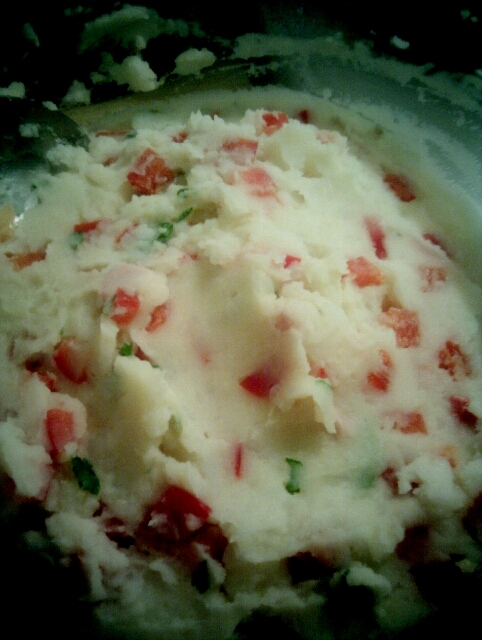 The potato biarritz recipe in Potato adds diced red peppers, green onion, and ham to mashed potatoes. It's an interesting variation on mashed potatoes. What else might taste good mixed into mashed potatoes? Garlic slow-roasted with a bit of olive oil until soft, then mashed into the potatoes works well. There's also champ which is Irish; mashed potatoes with spring onions in it. Sour cream and cream cheese, together, mmmmmmmmmm! Also if you boil the garlic with the potatoes it adds flavour to the broth and the potatoes. You then mash the garlic with the potatoes at that time. I've never tried it, but I would think that cooking the potatoes in stock rather than water would also lend a nice flavour. If you don't have any stock, adding in a carrot, an onion and a bit of celery to the water (plus bouquet garni and some peppercorns) and getting it to a boil before adding the potatoes could also add a bit of interest. Adding in sauteed onions (or shallots) adds a nice flavour as well and a bit of cheddar too. If you have any rendered duck fat, adding in a *bit* of that adds an incredible flavour (if you like the flavour of duck).